The Moolavar is Lakshmi Narasimhar, Vayalaalimanavaalan, seen in seated posture facing west. The Utsavar is Thiruvaaloi Nagaraalan. Thirumangaialwar's Devi Kumudavalli Naachiyaar was brought up at this sthalam. The Lord Vayalaali Manavaalan mentioned in the Divya Prabandam is seen in Thiru Nagari & not in Thiru Vaali. Hence the two sthalams are counted together as one divya desam. The temple is located 3 miles from Thiru Vaali. The Moolavar is Vedarajan (Vayalaalimanavaalan) seen in seated posture facing west. The Utsavar is Kalyaana Ranganaathan. This is the birth place of Thirumangaialwar & there is a separate sannadhi for him, where he is een in the form of a hunter. Two of the 5 Narasimhars worshipped by him are in this temple. An idol-Sindanaikiniyaan worshipped by the alwar can be seen beside him. The spot where Thirumangaialwar robbed the Lord - Vedarajapuram is situated about half a mile from this sthalam. Since the Lord gave darshan in wedded pose, he came to called Kalyaana Ranganaathan. Direction and Posture Sitting posture and West-faced. Features There are two kshetras here: Thiruvali and Thirunagari, separated by about a couple of miles. Thiruvali hosts a sanctum sanctorum for Sri Narasimha too. Access to the temple Accessible from Seerkazhi railway station. The Moolavar found in this sthalam is Sri Lakshmi Narashimar. Also known as Vayalaali Manavalan. Irundha (Sitting) Thirukkolam facing his thirumugham towards west direction. 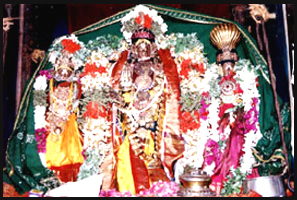 Prathyaksham for Thirumangai alwar and Allathi Nikanchama Prajapathi. This temple lies in the Tanjore district of TamilNadu. It's about 6 kms from Thirunaangur. If taken the route of Keezh salai from Thirunaangur its about 3 1/2 kms . No arrangements for staying are furnished.